The richness of Raspberry Vinegar is as strong and sensual as its colour, and it has a myriad of amazing uses when partnered with food. Whilst Astrid has been working her wonders with our bounty of Apples, I have been researching the alchemy of Raspberries and wondering what to do with this year’s hyper-abundant crop after we have filled a freezer with pies, crumbles, ice cream and sorbets. ‘Hello’ to Nigel Slater’s advice on Raspberry Vinegar and its many uses. And the preparation is so easy. Just take one lb or 450 grams of the fruit, crush it into a stainless steel (non-aluminium) pan with 450 ml (3/4 pint)of white wine vinegar. (So that's equal gms to mls with any quantity of fruit). Leave it for a few days and then put it into a jelly strainer over a stainless steel or glass bowl. Leave overnight. Put the result in a steel pan with 100g (3 1/2 ozs) granulated sugar to gently boil for 10 minutes and then put the cooled liquid into sterilised bottles (just look at those home-made labels. I must get a life). Just leave it for a few days and you are ready to make wonderful salad dressings, de-glaze pans when making rich casseroles, particularly beef, pour it over ice cream for a treat with a zing and splash it on ice cubes, topped up with lemonade, to discover a taste that will tingle your tongue to your tummy (the child lives in the man, folks). The important bit to sort out is the jelly bag straining. 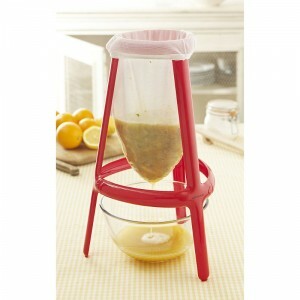 You will find this device essential for jams, jellies, fruit juices and flavoured vinegars. Good news is that I have tracked down and ordered a purpose made jam and jelly strainer bag from those amazing people at Lakeland Plastics. If they were an ordinary house, their pantry store cupboard would be the size of Wembley Stadium. Have a closer look for yourself: The Jelly Straining Kit, new improved model. Ideal for Raspberry Vinegar, jams, jellies, and a myriad other foods.